Bitumen are a dense, propelling post-industrial unit from Melbourne, expatriated from Hobart. Experiencing their mesmeric live performances is to engage with a tense yet assured force. This year, the band have supported the likes of iconic UK post-punk group The Chameleons, and the needs-no-introduction Lydia Lunch, both in Melbourne and in Hobart as part of Dark Mofo festival. 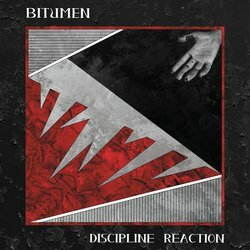 Lash is the first track from Discipline Reaction, the much anticipated debut LP from Melbourne based post-punk industrial unit Bitumen. This free-standing document was recorded at Magnet Studios in Coburg, and produced by the band with the help of Alexander Anglias (The Faculty, Ill Globo) – the phantom fifth member, and realised with the guidance of Peter Bramley (Vacant Valley).